I invited my sister to come over for dinner after we had made plans to hang out in the afternoon. I wanted to make something quick that she would like. So I took out some prawns from the freezer as that would cook quickly when we got back home. I was having a bit of trouble thinking of a marinate, but then decided to give the prawns, a bit of an Indian twist. This wayt we could eat it with some roti that I had on hand. I barbecued up the prawns when we got home and we used the roti to make a delicious prawn wrap with some vegetables. 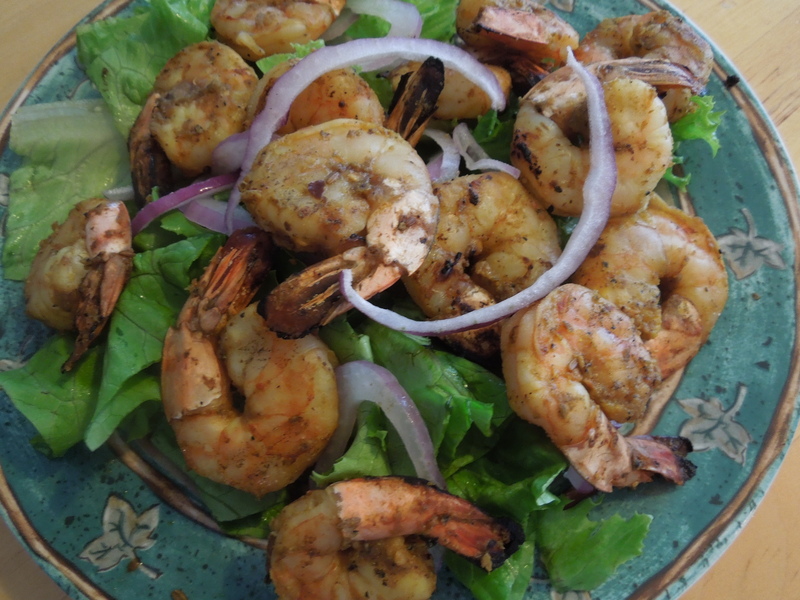 The next day, I threw the prawns in my salad and had a lovely lunch that was perfect for a hot day. If you are going to barbecue the shrimp, remember to soak the skewers in water beforehand, so that they do not burn on the bbq. *1 tbsp coarsely ground roasted cumin seeds. Add all the ingredients together. Marinate for a couple of hours in the refrigerator. When you are ready to barbeque, push the prawns through a wet bamboo skewer. About 5 prawns per skewer. Do not cramp all the prawns together as it will not cook evenly then. You could also stir fry these prawns if you prefer not to barbeque. * For the roasted cumin seeds- heat pan and toast the seeds for a few minutes until it starts to brown. Using a mortar and pestle or grinder, coarsely grind the seeds. I often make a few tablespoons of this roasted seeds and keep it on hand to add to my dishes.